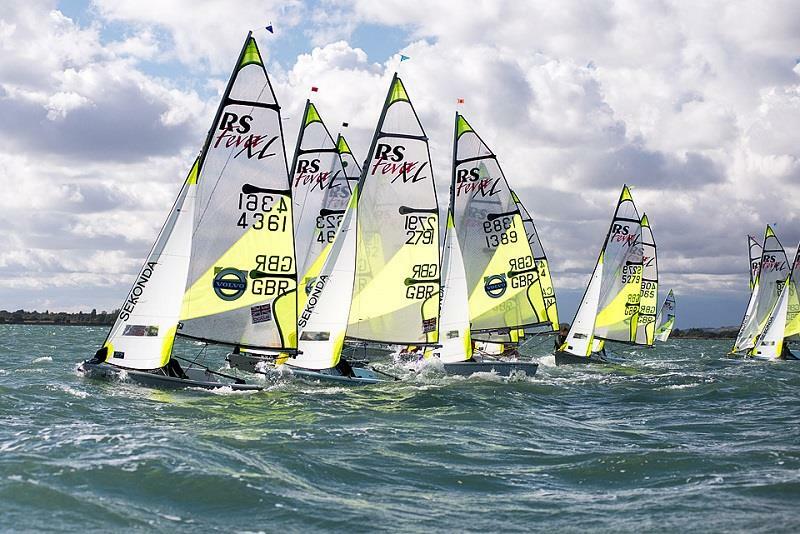 Hayling Island Sailing Club hosted the first Volvo GP of the new racing season. 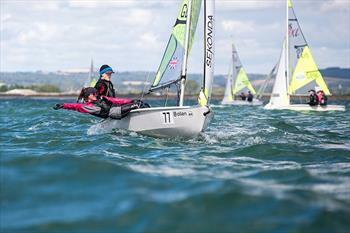 Forty one boats travelled from across the UK for this RYA squad selector event. Many were new teams pairing up for the new season. Light winds, sunny spells & the odd black shower cloud, set the scene for the first day. The race officer decided to set the race course in the harbor, in case some of the shower clouds turned stormy. The first race got away all clear in 10 knots of breeze, & leading at mark one was Huw Nunn & Dom Cotterill; 2nd Greg Kelly & George Catchpole with James Hammett & Ben Todd 3rd. Huw & Dom held onto the lead as the wind increased to 20 knots, under a black cloud, whilst Will Taylor & Fiona Mulcahy gained on the run to 2nd. When the wind dropped again Harvey Martin & Bobby Hewitt managed to climb through to 2nd after a terrible start which saw them barging at the pin then being penalized by the class judge for excessive body movements. On the final run they soaked low & took the lead from Will & Fiona in 2nd, with Huw & Dom in 3rd. For race two the wind had swung right this biased the line resulting in a general recall. For the second start two boats were caught on the black flag. First at the windward mark were Josh Boniface & Jake Carpenter, with Will & Fiona in 2nd, whilst Billy Venis-Ozanne & Orla Mitchell rounded 3rd. By the gate Will & Fiona had the lead, & as the breeze picked up to 20 knots for the finish it was Will & Fiona in 1st; 2nd Billy & Orla; 3rd James & Ben, whilst many back markers started to flounder. With each black cloud the wind shifted, this delayed start three, then to compound things further the course was getting shallow so the committee boat had to move to deeper water. Eventually race 3 started with a slightly depleted fleet, in 15 – 20 knots. 4 boats were caught black flag but again it was Will & Fiona out in front at the first mark; 2nd Greg & George; 3rd Louisa Coxson & Emily Woodcock. By the gate James & Ben were in 2nd (but black flagged) Greg & George 3rd. The race was won by Will & Fiona; 2nd Billy & Orla; 3rd Greg & George. On day two with a similar forecast of sunshine, & showers, & big gusts, the race officer set the course in the harbour entrance allowing easy access to the beach if a storm blew through. The big breeze did arrive just before the start so a postponement went up while a few early swimmers sorted themselves out. The wind then moderated to 12 knots and the sun came back. Race 4 started all clear. In the lead at the gate were Will & Fiona; 2nd Tim & Flo Peters followed by Ed Norbury & Charlie Hutchings. By the end of lap two Will & Fiona held their narrowing lead from Harvey & Bobby.On the last beat Greg & George were in front & took the win at the finish. 2nd Harry & Bobby; 3rd James & Ben. For race 5 two boats were over but both came back. At mark one Greg and George were in front of Rory & Josh, but by the gate Tim & Flo had caught up to 2nd. Race 5 was shortened as a black cloud came through, so the win went to Ed & Charlie; 2 Greg & George; 3rd Tim & Flo. Race 6 got away at the 2nd attempt in 16 knots but building with the black clouds making racing tough in the harbour mouth. Rory & Josh lead at the first mark followed by James & Ben then Will and Fiona, by the gate James & Ben were leading. The wind dropped to 10 – 12 knots as the boats finished, all boats heading home. 1st James & Ben; 2nd Harvey & Bobby; 3rd Harry & Matt. 'Feva Diva' voted as 'most polite boat of the day'. So winners of the Volvo RS Feva Grand Prix at HISC were Will Taylor & Fiona Mulcahy of Alton Water SC / Aldeburgh YC, second were Harvey Martin & Bobby Hewitt of Ogston SC/ Leigh & Lowton SC; and third Greg Kelly and George Catchpole of Burnham YC/ Isle of Man YC.